The mild steel single door wall mounted range, MAP, with a IP 66 protection degree, comprises enclosures with a horizontally hinged door plus top and bottom gland plate openings. Each of these enclosures can be easily combined with another wall mounted enclosure, which allows for the creation of configurations with two compartments with individual access. Water and dust are prevented from entering the enclosure, thus eliminating the risk for component failure, and with that, unnecessary downtime. Body: 1.5 mm mild steel. Gland plate: 1.4 mm mild steel. Door: 1.5 mm mild steel MAP0306030R5 / 2 mm MAP0308030R5 and above. Mounting plate: 2 mm galvanized steel. Surface mounted with 130° opening. Concealed removable hinges with captive pin. Hinges can be mounted to allow top or bottom opening. Mechanical door stop keeps the panel open. Inner M6 welded studs. One removable mounting profile on the hinge side. Sealing is ensured by an injected one piece polyurethane gasket. Customized lock with double-bit for easy opening of the panel. Double-bit 3 mm insert and 90° movement. Other inserts are available as an accessory. In top and bottom. Situated at the far rear of the enclosure, to make cabling onto the mounting plate easier. Gland plates (AF) and gaskets (AG) are not included. If the MAP panel is to be combined to an MAS or MAD enclosure, then the gland plate from the MAS/MAD enclosure can be used with the MAP panel. Mounted stand alone, complies with IP 66 | TYPE 4, 12, 13 | IK 10, providing you mount the gland plate(s) and gasket(s), supplied as an accessory. Combined with MAS or MAD, complies with IP 55 | TYPE 12. 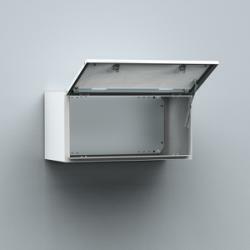 Enclosure with panel and one panel mounting profile. Plastic double-bit 3 mm key and mounting accessories. Earthing facilities. Mild steel wall mounted enclosure with a horizontally hinged panel door, top and bottom gland plate openings, providing a high IP 66 protection degree once covered. The enclosure can easily be combined with another single or double door wall mounted enclosure if further installation space is required, maintaining internal communication. The installed components inside the enclosure will be safe and secure due to the high protection degree. Combining enclosures allow customers to create enclosure configurations made up of two compartments with individual access. Component failure and unnecessary downtime is avoided as water and dust are prevented from entering the enclosure. If the enclosure is to be used standalone, and not combined to another, then two or four gland plates, depending on the enclosure's size, will need to be ordered separately in order to achieve the stated protection degree.